The image on the right should give you a general idea of what technologies Pitivi depends on. The Pitivi user interface is made using GTK+, a toolkit for creating graphical user interfaces using widgets and event handling. GES (GStreamer Editing Services), a library wrapping Non-Linear Engine to offer a higher level friendly API for video editing. Non-Linear Engine is media-agnostic and has no notions of video editing. 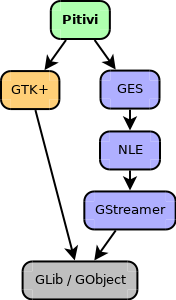 Non-Linear Engine is basically composed of a few thread-safe GStreamer plugins which allow compositing and mixing and translating the project's timeline dynamically into a GStreamer pipeline. GStreamer, a multimedia framework that allows us to do anything multimedia-related. It is very flexible and uses elements that are packaged in the form of plugins. These elements can be codecs/muxers/demuxers/effects, etc. Ultimately, all the components above are based on GLib and communicate through its signals. GLib is a low level C library that provides fundamental types and algorithms. It is a base upon which everything is constructed. Since we interact with GStreamer through GES, in Pitivi we can see the GLib basic types (gboolean, gchar, gint, gfloat, gdouble etc). GObject is a part of GLib that provides an object-oriented framework for C.